The introduction of lithium-ion cells was driven by the need for a lightweight rechargeable cell to power the rapidly growing market for portable electronic equipment in the 1990’s. Starting with cameras and mobile phones, the technology has become the power source of choice for everything from cordless power tools to large scale energy storage and automotive applications. The high-energy density and large number of discharge cycles provided by lithium-ion cells are the most important factors, which make them indispensable in mobile phones and electric vehicles alike. However, there are many other ways in which they are superior to traditional battery chemistries. As well as the high-energy density of the cells, they are able to discharge at a higher power and can then be re-charged much more quickly. 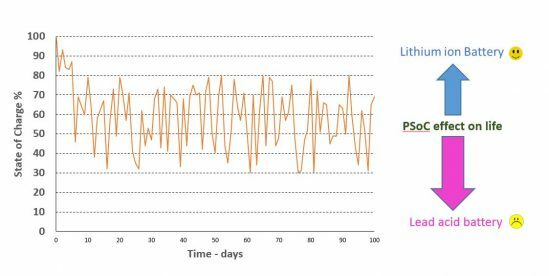 In applications where charging power or time may be limited, such as solar PV systems or stop-start cars, it is not harmful to operate lithium-ion cells continuously at partial state of charge. This gives them greater operating flexibility than lead acid cells. 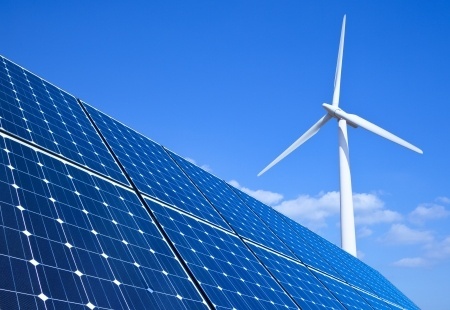 The interaction between lithium-ion cells and the environment is very mild. There are no gas emissions from charging cells and heat loss, due to charging inefficiency, is very low. This means that it is possible to use lithium-ion cells in closed cabinets, completely isolated from their surroundings. At end of life the cells should be re-cycled but they contain no controlled toxic materials such as cadmium, mercury and lead. Lithium-ion operation employs the same principles as any other rechargeable battery. 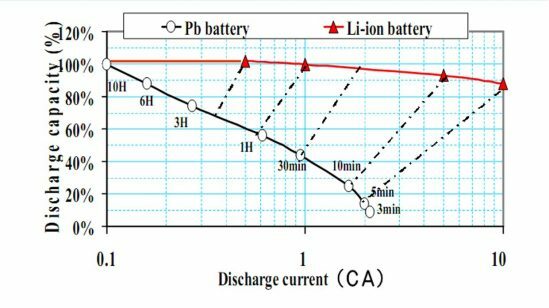 During discharge, electrical charge moves through an external wire circuit between the electrodes of the battery. To balance the charge transfer within the cell, positively charged lithium-ions move through an internal electrolyte circuit between the positive and negative electrodes. During re-charge the process goes into reverse and lithium-ions move back through the electrolyte. 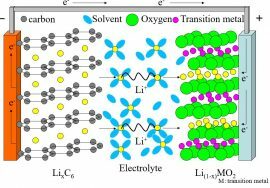 Many different types of chemical can be used to make the electrode materials which carry the lithium-ions. This is a very active area of research and development, which is promoting the use of lithium-ion batteries in an increasing number of applications. Some examples of the chemicals that can be paired together to make cells are shown below: As each pair of materials will make a cell with different electrical properties, it is important to select the right cell for a particular application and not to mix or replace cells with different chemistries. 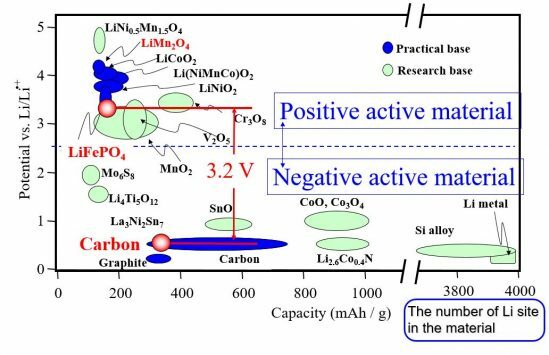 For example, Lithium Iron Phosphate (LFP) cells combine a carbon negative electrode with an iron phosphate positive electrode to make a cell with an operating voltage of 3.2V. Four of these cells can be connected in series to make a 12Volt automotive battery, which is directly compatible with most vehicle electrical systems. This would not be possible with a Lithium Cobalt Oxide (LCO) cell, as it has an operating voltage of 3.7V. Cell structure – The cell structure for larger capacity cells uses a prismatic design with robust metal walls. This provides the optimum combination of packing density, thermal management and protection required for industrial and automotive applications. Battery Management Systems – Battery Management Systems (BMS) are an essential component for the safe operation of multi-cell lithium-ion batteries. The primary function of the BMS is to bring all the cells in a battery to the same state of charge and to maintain them in that condition throughout the life of the battery. The BMS achieves this by monitoring the voltages of all individual cells within a battery. Cells with higher voltages are discharged to bring them in line with the rest of the pack. The large quantity of information collected by the BMS allows the battery condition to be monitored precisely and gives enhanced security compared with traditional battery technology. This increased intelligence also reduces the costs for maintenance and extends the operating life of battery systems. 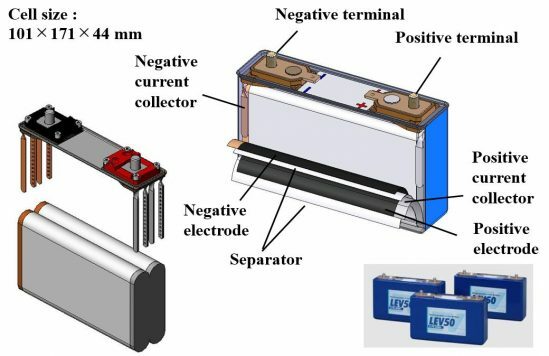 Transportation – The transportation of lithium-ion batteries is regulated because their high energy content must be controlled with standard packing procedures. Lithium-ion batteries are Class 9 Hazardous Materials and all packaging must be labelled accordingly with the UN3480 identification number. Commercial cells must have passed the series of safety tests defined in UN Manual of Tests and Criteria Part III subsection 38.3. Certification and packaging advice can be provided by GS Yuasa Technical Services for transportation related issues. 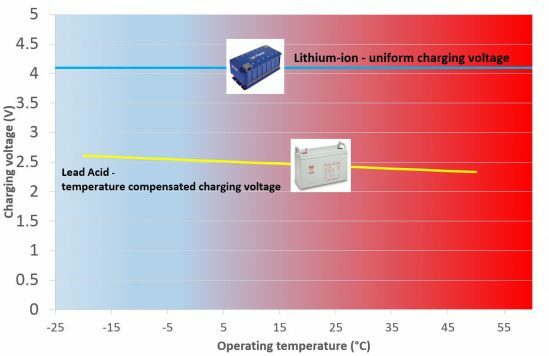 Standardisation – Standardisation of lithium-ion batteries has evolved rapidly to reflect the growing range of application areas for this technology. For industrial uses, the main body of internationally recognised standards is provided by the International Electro-Technical Commission (IEC). Cell and battery performance standard requirements are contained in IEC62620 (2014). Safety standard requirements are contained in IEC62133-2 (2017) for portable appliance applications and IEC62619 (2017) for industrial systems. 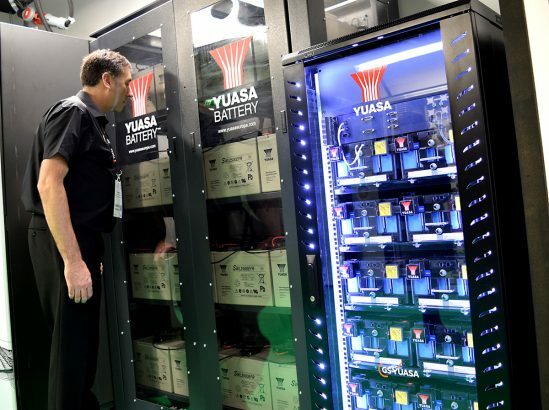 Working at the forefront of technology, GS Yuasa is a global leader in battery development. Accomplishments such as applying the sophisticated technologies we developed for special-application batteries and successfully mass producing automotive lithium-ion batteries ahead of competitors have contributed to our reputation for innovation. Our technologies are used in many hybrid and electric vehicles, which has promoted their widespread adoption. Advanced GS Yuasa lithium-ion batteries are used in a wide range of applications from the deep sea to 36,000 Kilometers. Wehave more Watt Hours of li-ion power in space applications than any other battery manufacturer, with cells installed on over 110 different satellites and space craft. 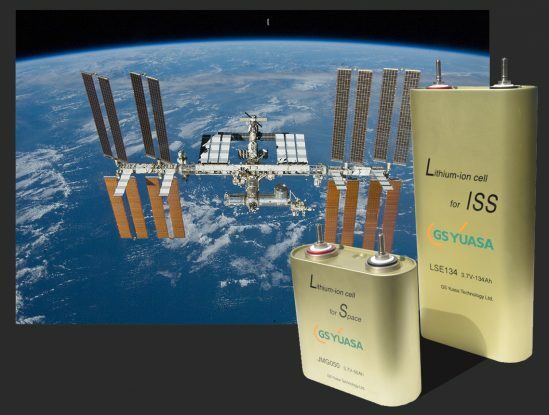 In 2016 GS Yuasa lithium-ion cells were adopted to replace the International Space Station’s existing batteries. Developed and manufactured by GS Yuasa Technology Ltd, the space lithium-ion cells boast high energy density and long life. They have optimal design for ISS operations, which require highly efficient charging and discharging. 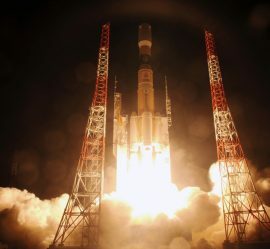 GS Yuasa lithium-ion batteries help to power Japanese H-IIA rockets into space. Developed together with Mitsubishi Heavy Industries, the GS Yuasa lithium-ion batteries are used to power electronic devices on-board the rocket, which is an improved version of earlier models. 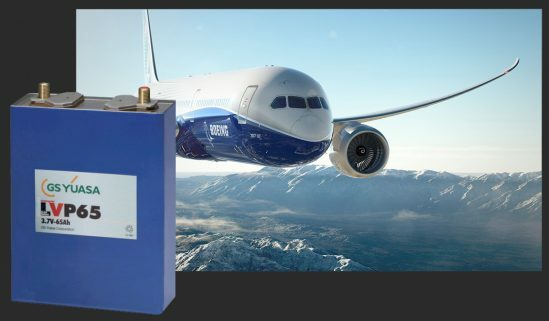 Closer to Earth, but still thousands of feet in the air, GS Yuasa lithium batteries are used on the industry leading Being 787 Dreamliner which has unparalleled fuel efficiency and range flexibility enables carriers to profitably open new routes as well as optimize fleet and network performance. Up to 6,500 meters below the ocean surface GS Yuasa provides the manned research submersible, the Shinkai6500, with its primary power source: compact, sophisticated batteries capable of resisting the extreme water pressure of the deep sea. The isolated and extreme nature of these inaccessible environments demand the highest levels of reliability. That’s why GS Yuasa is chosen for these extreme applications. As world leaders in Lithium-ion technology GS Yuasa also offer a wide range of adaptable energy storage solutions for all renewable and reserve power applications on Earth. GS Yuasa LIM High Power modules, LIM High Energy modules & energy storage cabinets provide the same high quality, performance & reliability that has ensured absolutely no cell failures in space. 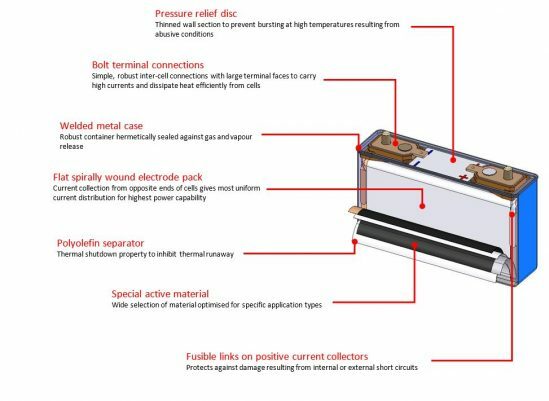 We continue to develop new products and solutions for reserve power and energy storage applications, including the Dual Chemical Battery System which utilizes both Lithium-ion and Valve Regulated Lead Acid batteries, and Lithium-ion battery container solutions.